This shuttle provides free transportation to all parts of the Cambridge and Harvard Business School campuses. This service is limited to students and other Harvard affiliates with a Harvard I.D. For information check Shuttle Tracker where you can locate specific buses on your computer or hand held electronic device. The M2 Shuttle runs between Cambridge and the Longwood Medical Area. Students at HMS, HSPH, HSDM, GSAS, DMS, HBS and FAS, as well as Harvard University officers and staff, need only to swipe their University ID cards to ride the bus free of charge. All other students and scholars and family members of affiliates must purchase tickets. In the Medical Area tickets may be purchased at 180 Longwood Avenue (Parking & Transportation Office), and in Cambridge at the Events and Information Center on the ground floor of the Smith Campus Center. Schedules may also be picked up at these locations. 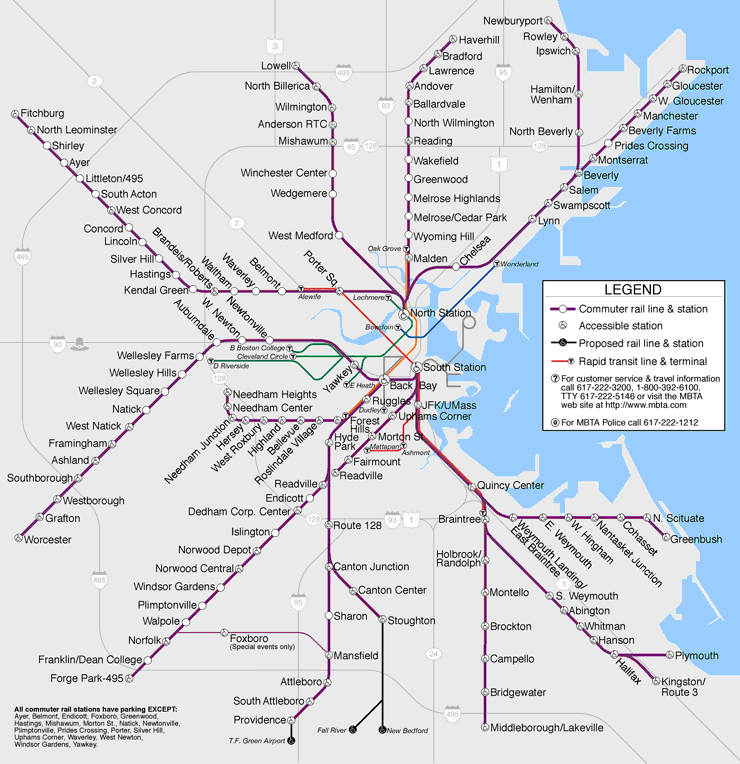 The public transportation system in the Boston area is called the MBTA or the "T". The "T" consists of subway, bus, and commuter rail services. Street signs indicate subway or bus stops. Service runs seven days a week from approximately 5:00 am to 12:30 am. Bus schedules may also be found at the Harvard Square and the Park Street stations. The Customer Service Center is located at the Downtown Crossing Station where the Red and Orange Lines cross. It is open from 8:00 am to 6:00 pm. The subway consists of four lines which radiate from downtown Boston. They are the Red, Green, Orange and Blue Lines. The terms inbound and outbound are used to indicate which direction you are going on the lines. The Red Line runs inbound towards Park Street Station in Boston and outbound going away from Park Street Station. The stop for Harvard University on the Red Line is Harvard Square. It is on the way from Park Street Station to Alewife Station. The Green Line (that has B, C, D, and E Line) runs inbound to Park Street Station and outbound from Park Street Station as well. The Longwood Medical Area is located between Park Street and the Boston College stop. The Orange Line runs inbound to Downtown Crossing Station and outbound away from Downtown Crossing Station. This is where the Customer Service Center is located. The Blue line runs inbound towards Government Center Station and outbound away from Government Center Station. The Blue Line has a stop called Airport, where you can then connect to shuttles that take you to the terminals at Logan Airport. The Silver Line is a bus service but is considered a subway line. It connects with every subway line except the Blue Line. From South Station on the Red Line you can transfer to the Silver Line and it goes directly to all the terminals at Logan Airport. 1 - Harvard/Holyoke Gate - Dudley Station via Mass. Ave.
69 - Harvard/Holyoke Gate - Lechmere Sta. 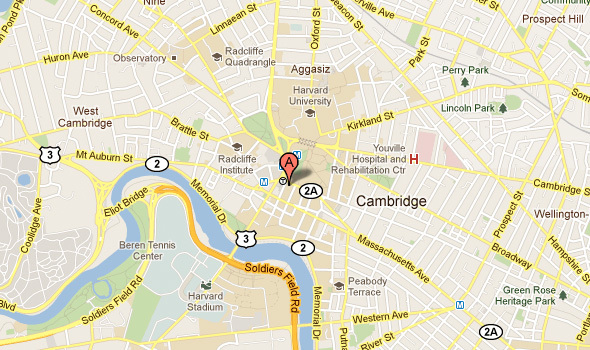 via Cambridge St.
71 - Watertown Square - Harvard Station via Mt. Auburn St.
72 - Huron Ave. - Harvard Station via Concord Ave.
75 - Belmont Center - Harvard Station via Concord Ave.
77 - Arlington Heights - Harvard Station via Massachusetts Ave. The Commuter Rail or Train is also called the Purple Line and primarily services suburban towns. Trains going north start at North Station on the Green Line; and going south at South Station on the Red Line in Boston. For riding on the subway and bus you must use a Charlie Card. Transfers from one bus to another are allowed without extra charge within a two hour period. Transfers do not apply from subway to bus travel. Money is deposited to a Charlie Card at vending machines located at any of the subway stops. You can buy a Charlie Card at some subway stations as well as some retail stores. There are different types of T passes that can be purchased on the 15th of the previous month to the 14th of the current month. If you are being paid by Harvard or a Harvard-affiliated hospital and are eligible for employee benefits, you will be eligible for the Harvard MBTA Pass Program. Harvard offers its employees a 50 percent discount on monthly bus, subway and commuter rail passes. You can purchase your pass online, and need only to sign up once for automatic monthly renewal. Payment is made through pre-tax payroll deduction, so buyers save even more on top of Harvard's subsidy. You must sign up online at least one month in advance of the month for which you want a pass. For instance, to be eligible for a November pass you must sign up before October 1. Passes are mailed to your home address. Travel by taxi in the Boston area may be an expensive way to get around, but it can be convenient. Most people either get a taxi by telephoning and having the taxi pick them up (the taxi company will most likely ask for a cell phone number so they can call when they arrive) or go to get a taxi at a taxi stand. A listing of taxi companies can be found in Yellow Pages Telephone Book. In Harvard Square there are taxi stands in front of the Smith Campus Center, the Harvard Coop, The Charles Hotel, and The Sheraton Commander Hotel. In the Longwood Area taxies can be found at the entrance of a hospital. Owning a car is expensive and maintaining a car (especially a used one) may be a constant financial burden. Before buying a used car, you should have a qualified mechanic examine the car. Massachusetts does have a Buyer's Right to Return Law that allows the buyer of a used car to return it for a full refund under certain conditions. Watertown: Watertown Mall, 550 Arsenal St. (Take the Red Line inbound from Harvard Square one stop to Central Square Station. Then take bus # 70 - Cedarwood, No. Waltham or Watertown Sq. - University Park via Central around the corner on Green Street). All car owners must also pay an annual excise tax, which varies according to the value of the car. Some communities do not allow overnight parking on the street. Others limit daytime street parking to intervals of two hours. Never assume that a parking space will be included in the rental price of an apartment, even if there is a parking lot or garage in or near the building. In Cambridge and Boston, a majority of the streets require a parking permit that can be obtained only if your car is registered in that town. Local ordinances prohibit parking on certain street cleaning days. Pay close attention to posted signs before parking your car. Even where street parking is permitted, it is often difficult to find a parking space. Coin operated meters monitor the length of time you are permitted to leave your car in a parking space. If the words "violation" or "expired" appear on the meter, the allotted time has ended and you are expected to move the car or you will get a parking ticket. Parking tickets must be paid or penalties will be assessed. During the winter months when snowfall is particularly heavy, snow emergencies will be declared. TV and radio news reports announce snow emergencies. At these times, parking is prohibited on many streets. Signs are posted on the streets that are included in this parking ban. In order to rent a car in the Boston area you must have a driver's license and a major credit card, and must be 25 years or older. Zipcar provides another alternative to car ownership. Zipcar provides cars for rent at hourly and daily rates. All reservations include gas and insurance and international drivers licenses are accepted. Sign up here for a discounted membership rate and use one of 50 Zipcars across campus or hundreds more across the Boston area. For more information on bicycling commuter benefits, department bike-share programs and other bike programs and resources, visit Harvard Campus Services CommuterChoice site. When riding a bicycle you must observe traffic laws, be cautious (do not assume car drivers can always see you), and always lock the bicycle when leaving it unattended. Lock the bike in a well-lit and well-traveled area, rather than in an isolated area where it could be easily stolen. Invest in a sturdy bicycle lock. With so few bicycle paths, cyclists must bike on the street with the flow of car traffic. A popular bicycle path is the one along the Charles River. You should always wear a bicycle helmet while biking. $10 helmets can be purchased with cash or check at the CommuterChoice Office: 1350 Massachusetts Avenue Room 837. You may register a bicycle with the Harvard University Police (HUPD) by going in person with the bicycle to Police Headquarters at 1033 Massachusetts Avenue or to 180 Longwood Avenue in Boston. Mon, Wed, Thurs, Fri 9:00a.m. - 3:00p.m. Tues 11:00 a.m. - 5:00 p.m.